An overview of Mircea Pitici's latest annual "The Best Writing on Mathematics 2015." First, I'll say this is probably (to me) the best volume in this series yet, with a higher number of 'heavy hitters' than in prior volumes; and as Pitici admits, a heavier "recreational" component than past efforts. It also includes two of my very favorite, perhaps lesser-known expositors, Scott Aaronson and Natalie Wolchover. While I'd read some of these selections previously, most were new to me. It ought be pointed out that, because of publishing lag time, though it is called "Best Writing on Mathematics 2015" the selections are actually mostly from 2014. Thus, many excellent pieces from 2015 are missing here. Some prominent names absent from this collection, include: Brian Hayes, Erica Klarreich, Keith Devlin, Siobhan Roberts, Julie Rehmeyer, Jordan Ellenberg, Terry Tao... perhaps they'll be in the 2016 edition. Many other recognizable popular writers are included in the volume: Steven Strogatz, Vi Hart, Arthur Benjamin, Dana Mackenzie, John Conway, Andrew Gelman, Colm Mulcahy, Eli Maor, and Maria Freiberger. And one piece is so completely focused on work by Tim Gowers, that he too could almost be viewed as a contributor. "...the context of good recreational mathematics straddles the popular and the pedagogical, having the dual value of intellectual entertainment and optional instructional use. At its best, recreational mathematics illustrates the synergetic encounter between the ludic and the serious aspects of mathematics, as well as the one between the amateur and the professional strands of doing mathematics -- just two of the many polarities of contrary/complementary features that meet and mesh in mathematical thinking and practice. I am glad that this year 'recreational' mathematics is well represented in the anthology." But with that said, there are also pieces touching on philosophy, applied math, pure math, statistics, education, biology, and art -- a real assortment and diversity as is typical for Pitici (you might expect such range from an anthology with multiple editors, but it is more pleasantly surprising from a single editor). Pitici always confesses too that the collection is a very eclectic, personal endeavor -- a different editor would likely result in a very different volume. The book is intended for both lay and professional readership. I'll note though that a certain level of math aptitude or familiarity is required for several of the selections -- these are not the sort of "everyman" readings that Strogatz's much-lauded series for the NY Times was... although Strogatz's own entry here (about that very NY Times series) is very much an "everyman" piece. Some readings will definitely require hard work/concentration on the part of the reader. Erik Tou's piece "Juggling With Numbers"
Burkard Polster's piece on "Kenichi Miura's Water Wheel"
These were just some pieces that I'd not seen before, and that covered some unusual ground -- your own favorites, as with any anthology, will be governed by your own personal interests. Worth noting, that the Introduction contains a lengthy list of noteworthy books, mostly from 2014, and at the book's end comes a long list of articles that were good, but didn't make the final cut for inclusion -- in short, this collection of 29 pieces can lead you to a lot of further reading. "Interpreting mathematics is a further stage of thinking mathematically -- not a "higher" stage or a "lower" stage, just an essentially different one. Interpreting mathematics is not about mathematical truth (or any other truth); it is a personal take on mathematical facts, and in that it can be true or untrue, or it can even be fiction; it is vision, or it is rigorous reasoning, or it is pure speculation, all occasioned by mathematics; it is imagination on a mathematical theme; it goes back several millennia and it is flourishing today, as I hope this series of books lays clear... To speak about interpreting mathematics sounds odd, but it seems so only because the customary indoctrination served by our school system pervades the common views of mathematics, both among mathematicians and the lay public." Though I've skimmed all the entries, I'm still working through the volume in greater detail. And I find myself treating it like a dessert tray! : after a day of perusing, sometimes mundane or commonplace math content, I reach for Pitici's volume at night and pick out one chapter as my 'dessert' for the day! One interesting bit of synchronicity for me, was an entry toward the end of the volume about a Canadian scandal in their national lottery, discovered by a mathematician. I don't much follow lottery news, but a few weeks back I'd read about a scandal in the U.S. involving several state lotteries being rigged, and then came all the hoopla over the biggest Powerball payoff in history (scandal-free, and, surrounded by eager participants, I purchased a ticket for the first time ever myself), and then this Pitici pick -- just an odd confluence of news about a subject I hadn't previously paid much attention to. Anyway, I'm just happy to see the 'Best of Math....' series continuing; thank you to Dr. Pitici and Princeton University Press for that. It's a nice start to a new year that already has some fantastic math reads on the way. And each year Pitici surprises me a bit (mostly in a good way) with his choices. And coming on Sun. I'll have a review here of Dr. Pitici's latest volume. 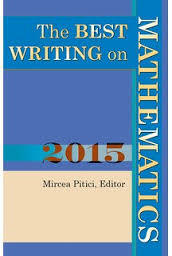 If you're familiar with the annual "Best Writing on Mathematics" series than you likely know the name "Mircea Pitici" (the editor) -- if you're NOT familiar with the series, then where the heck have ya been for the last 6 years!?? 1) Tell us a little about the background that brought you to a PhD. in mathematics and to being editor of a yearly math anthology. And when you're not working on your Best Writing on Mathematics series (BWM) how do you spend most of your professional time? Since early secondary school I liked mathematics and I was good at it (problems solving, problems posing, weekly postings on the high-school bulletin boards, national competitions, awards, and all that) but I always read with interest beyond mathematics. I went on to study mathematics at the University of Bucharest, in Romania, and I graduated during the political turmoil of the early 1990s. I even published a book in Romania, on non-mathematical topics. After coming to the United States I tried to switch to other areas (humanities, business, science studies) but nothing worked. Difficult times followed. I hit the bottom in a homeless shelter, for five agonizing months of harsh winter. I could solve differential equations and teach multivariable calculus but I was penniless, jobless, homeless, and eating from the pantry, utterly destitute in the richest country on earth, where mathematical instruction is supposedly needed, valued, and rewarded! My first attempt to start The Best Writing on Mathematics series failed when one of my two bags of belongings was stolen from me in the shelter; the materials for the book were in that bag. My PhD is in mathematics education; recently I attempted to start another one in mathematics but I failed even to be considered for admission. I failed in most endeavors I tried. You ask about my professional time; to me that sounds like a misunderstanding of my condition. Since I came to the United States I only held temporary positions and odd jobs; I never had a real, full-time, well-paid job, despite doing well my duties in whatever I was allowed to do. Currently I am unemployed, going to the library, taking care of my teenage daughter when she is with me, and shuttling between New York and North Carolina to visit my wife and toddler son. After finishing the PhD I tried hard to find a job but again I failed, so far. I am brimming with projects and ideas but I have to put them on hold, in order to focus on survival. 2) This year's Best Writing on Mathematics 2015 is the 6th in the series you started. First of all, CONGRATULATIONS! How did that whole series begin... was Princeton University Press looking for someone to do such a volume or was it your idea and you went looking for a publisher to take it on? And if it was your idea, how hard a sell was it to find a publisher? For a few years after I left the homeless shelter I wrote to various commercial publishers, explaining that I want to edit a series like this, but nobody replied—until Steven Strogatz heard me out, contacted Vickie Kearn at Princeton [side-note: I previously interviewed Ms. Kearn at MathTango HERE], and told her that a graduate student at Cornell seems to have an interesting idea. That was it—what did not work in five years clicked in a few minutes! The rest is history, with some hard-to-believe details, which I leave aside, for another occasion. Vickie immediately related to my thoughts about the project and she remains instrumental in the making of the series. Now I feel that failing to find a publisher for several years was worth it, because I met the right partner for the enterprise; I am grateful for the trust Vickie and her colleagues put in me, to do this task. When the idea of such a series crossed my mind for the first time I searched the bookstores and the libraries, convinced that such books existed; but I could not find them. I recall Vickie saying, during our first telephone conversation, that she was surprised that nobody has already done this series. I was surprised too and somehow incredulous that I was about to succeed in something. In hindsight it is clear that the idea was viable but before we made it happen I encountered only silence or casual dismissal. This accomplishment, together with many plans in which I failed or I never got a chance to start, made me appreciate the role of good luck and bad luck in our lives. I tried many things and failed in most. When I think of those few in which I succeeded they turn out to have one important feature in common: I met people who trusted me to do the work. I value serendipity a lot more than I did when I came to the United States. I came to this country very naive and I paid an enormous price, over and over again; I am not yet fully cured. 3) Can you say a little about how BWM may have changed (if at all) over the years? This year's volume, in particular, is heavier-than-usual on recreational math... was that a deliberate decision on your part, or did it just evolve that way? I did the first volume (2010) quickly, in just over two months, pulling all-nighters in the library; it had a slightly different structure than the subsequent volumes. Starting with the second (2011) we settled on a template and on certain routines/schedules/processes that work quite smoothly (with occasional bumps on the road, to keep us on our toes). This is a fast-paced series; there isn’t much room for delay and second guessing. For the final selection of texts included in each book we take guidance from several professional mathematicians who grade each of about 60-70 pieces I initially propose for consideration; we also have to consider constraints related to length, copyright, and diversity of topics/authors. Inevitably the final selection is slightly tilted, each year, toward certain themes; this happens despite my contrary tendency to reach a selection as varied as possible, ideally unbiased, illustrating as many different perspectives on mathematics as the recent literature allows. Changes do occur, gradually. For instance, at some point I added a long list of also-runs, supplemented later by a list of special journal issues. The last two volumes contain sections with color figures. Also, the introduction to the current volume comes with an online version copiously enriched by a section on internet resources (read it here: http://press.princeton.edu/chapters/s10558.pdf). 4) How about the future of BWM; any foreseeable changes? Specifically, do you see a time when, like most other 'Best Writing In..." series on the market, each yearly edition might be edited by a different person, or do you hope to stay on as long as possible as editor? In the next volume the ‘notable writings’ section will come with two additional lists, one mentioning notable interviews with mathematical people (I will list your blog of course!) and another mentioning notable book reviews. When Vickie and I first discussed this project we agreed to limit the selection to published articles, and not to consider interviews and book reviews. Yet this series has become a reference source of sorts, so I think it useful to give the reader some direction in finding materials in these two important categories; it requires only marginal added effort on my part. I will not provide an exhaustive list of reviews (that’s impossible) but I will signal some that are truly notable, for going far in the discussion of a book. You should probably address the second part of the question to Vickie! Actually, I heard this question several times since I started the series and I will answer it frankly. For whatever it is worth, with its good qualities and its faults, the series undoubtedly reflects my vision—even though other people opine along the way, as I described. This can be traced to the initial, broad selection of pieces, which I propose. If someone else was in charge, they would come up with a totally different book than I do, perhaps even non-intersecting with the content we put out. Yet the constancy of one editor gives unity to the series as a whole, it makes it cohesive, and perhaps it builds a stable core readership. I will do this task as long as conditions allow me. And, if someone else will do it, I will still do one for myself! I just like to look in all sorts of places, some well-known to mathematicians but some quite unusual or rarely checked out by them, to see what people have to say about mathematics. I am curious. My sense is that I want to come up with a book I like to read; if I succeed in doing that, others will like it too. 5) Approximately how much time do you spend each week reading math for possible inclusion in the volume? And how much help do you get making the final selections for the volume? Or, if you don't have specific helpers, do you receive a lot of feedback and suggestions from mathematicians/readers about pieces to consider? I keep no roster of how much time I spend on doing these books. To me it is similar to breathing, almost effortless. I think about the next volume every day but the effective phases are irregular. Most days I don’t find anything interesting to consider or very little, so I do nothing consequential for the project. But at other times I might spend full consecutive days on it, in a frenzy of activity, if circumstances permit. I have a very complicated, fragmented, and demanding personal life; I must adapt my work to the non-professional duties I have. I wish I had a more stable professional trajectory and my family lived together (not spread over hundreds of miles), such that I can be more productive—but that state of affairs still eludes me. Usually in the middle of December I have 60-70 pieces, chosen from several hundred, which I propose as candidates for the next volume. This collection goes to 3-4 professional mathematicians chosen by Vickie. The readers (who almost always remain anonymous to me) grade the pieces and send back reports, sometimes with highly entertaining comments. Then we put everything together and make judgments based on the opinions of the referees, the multiple constraints we face (length of texts and copyright matters most prominently), and several criteria I hold dear for the making of the series: diversity of perspectives, diversity of mathematical branches, diversity of publications, diversity of authors represented (well-established personalities but also newcomers), non-overlapping content, balance of non-technical and slightly more technical articles, etc. We want these volumes to be accessible to the general public but also interesting to the professionals; when it comes to mathematics, that is catering to very different categories of readers at the same time; I hope we are succeeding, despite the challenge. For the broad scope I give to this series an excellent academic library is indispensable; I commend once again the services I enjoyed from the Cornell University Library—although I lost important privileges lately, after I finished my doctorate. Our series is more scholarly than any other of the similar Best… series on the market. I am comfortable with that; mathematics is special; we should not dilute the content in order to give the readers a false impression of facility. I receive a lot of feedback, most of it informal, most of it good, pleasing, cheery, even exalted. The more formal feedback comes in book reviews. It is fascinating and reassuring to compare the reviews. Almost every aspect criticized by some reviewer is praised by other reviewers. Where some people find faults, others see virtue. Every time I read an acute, insightful, penetrating, normative, theoretically helpful criticism—I wrote to the reviewer, thanking for his/her observations and asking for concrete suggestions of pieces that would rectify, in the next volume, the criticism they express in the review. I never received replies to these invitations! The point I am making is that regardless of what would be desirable to include in the volumes of this series, we are circumscribed by the material extant out there. I cannot include a certain type of article if I encounter nothing of that sort or if we cannot overcome republishing hurdles. Indeed I regularly receive suggestions from people, including their own productions—but not many. I always welcome suggestions and I try to remain blind to people’s eventual self-interest or self-promotion. I start from the premise that people are well intended. I consider everything that comes to my attention, regardless of the manner in which it reaches me. The non-technical literature on mathematics is vast and it is impossible for me to survey all of it; if people come forward to point out something new to me, I am grateful. A few of the pieces brought to my attention by their authors rightly made it into volumes; most of them did not. 6) Other than just reviewing/picking-and-choosing from so much available material, what is the hardest thing about putting out such an anthology every year? This question is the easiest to answer. By far the hardest thing is to leave out of the anthology excellent pieces which I know deserve to be included. I find texts I am sure will be in the book, only to put them aside in the final phase of selection, either because all the referees demur or because of the constraints I mentioned above. To alleviate this aspect I include at the end of the book a list of notable writings (which, by the way, takes me a lot more time than the pieces that eventually are reprinted in the anthology). I encourage readers to look over those lists and to find the articles and the books that might interest them. Some of the entries mentioned there are unlikely to be found by readers on their own. I hope I offer quick and reliable guidance amidst a huge information overload concerning mathematics. This feature of the series is my deliberate attempt to give the readers not only a selection of outstanding writings about mathematics but also a research tool rich in references they can pursue, now or later. 7) Anything else you wish to say about this year's edition, not covered above? Oh yes, I have a lot more to say, but I will limit myself to a few additional things. I see ‘this year’s edition’ as a convention imposed by our inevitable subservience to calendar strictures. Each volume should be considered together with the others, integral part of the series. It seems to me that the reviewers always ignore this aspect. To rectify somehow the situation, we are going to make available a combined index of the pieces published so far in the series. The main message of the series is that there is a lot more to mathematics than formulas and learning by rote—even a lot more than the stringency of proof and rigor usually associated with mathematics. Mathematics has interpretive sides with endless possibilities. By now this kind of literature has veteran practitioners easily recognized by the public but also many talented newcomers. It is a new genre, completely ignored in educational settings. Among other goals, I want The Best Writing on Mathematics series to help educators and perhaps policy makers see that it is worth broadening students’ understanding of mathematics. Mathematics is an extraordinarily diverse phenomenon molded by the human mind but anchored outside the mind, in a realm both abstract and concrete, at the same time. That is not easy to comprehend and to master if we are restricting the learning of mathematics to the use of conventional mathematical symbols, to notations that most people have trouble remembering, and to rigid manipulations of those symbols and notations. Mathematics is a tool of the mind more versatile than most of its practitioners allow—and its interpretive potential is certainly beyond the image it has in the public perception or in our schools. I hope The Best Writing on Mathematics series illustrates this idea and I wish I could explore it further with students. Instead, I am still searching for my first real job! My long-term unemployment suggests that editing the series has not helped me much in my professional career. Despite an excellent teaching record as a graduate student and before that, I am still looking for employment. Teaching mathematics is my best ability but it slowly fades into the past, as I cannot find an employer interested in my teaching. I feel this is a rebuke of my view of mathematics as a broadly encompassing subject worth learning in its myriad connections with history, culture, science, and technology. I see mathematics as a bulwark against dogmatic thinking—but that conception runs into a dogmatic view of mathematics that still prevails in America (with many exceptions, I hasten to say). I am not going to end on a pessimistic note or with a diatribe! Editing The Best Writing on Mathematics series gives me satisfaction in itself, not necessarily as a professional accomplishment. For instance I am happy to see that it is possible to bring together in the same book constituencies that are not comfortable going together, such as mathematicians and mathematics educators, purists and mavericks, entrepreneurs and artists. Hopefully this series will gradually contribute to a change in the broad perception of mathematics as a social, cultural, historical, and intellectual phenomenon with huge stakes in the working of contemporary humanity. Thanks, Mircea for filling us in on so much about both your BWM project and your own life! It's our great fortune that you got introduced to Vickie Kearn and Princeton University Press. Good luck in future endeavors. 8) I'm excited that on Sunday I'll be posting an interview here with Dr. Mircea Pitici, editor of Princeton University Press's "Best Writing On Mathematics" series... so do stop back then! 11) Will just note that this year's Joint Math Meetings in Seattle run THROUGH TOMORROW (Sat. ), and can be followed a bit via the Twitter hashtag #JMM16. Dr. Lamb is just hitting one home-run after another with her posts these days.